In 1918, World War I was raging. There were food shortages, and the U.S. government was shipping wheat and other foodstuffs to the troops in Europe. To help cooks on the home front use “conservation as far as possible of food which can be sent abroad,” the Kansas State Council of Defense published One-Dish Meals. 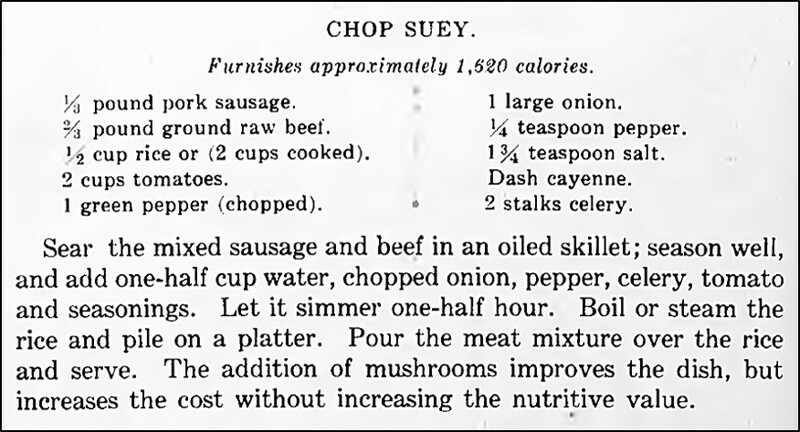 The booklet is filled with lots of intriguing recipes, but the recipe that grabbed my attention was one for Chop Suey. It bore little resemblance to the typical chop suey recipe. 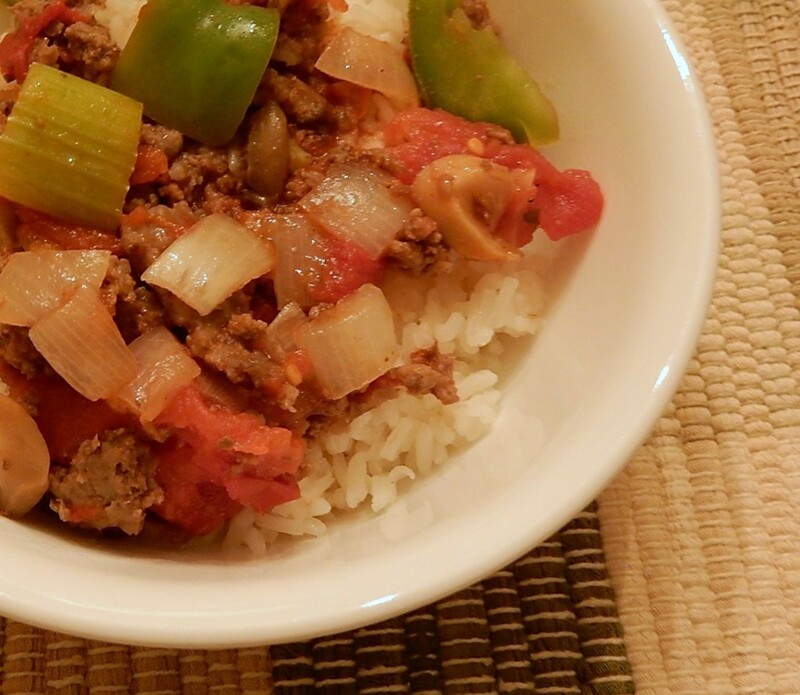 The recipe called for ground beef, sausage, tomatoes, onions, and celery – and not for any of the usual bean spouts, bamboo shoots, or soy sauce. That said, this recipe was delicious, and I’ll definitely make it again. I would like to thank ResearchBuzz for alerting me to the Kansas State Council of Defense cookbook (and to a number of other publications ranging from Silos in Wartime to Use of Wheat-Saving Cereals). Brown sausage and ground beef in a skillet using medium heat. Add, green pepper, onions, and celery; cook until tender. Stir in tomatoes, mushrooms, pepper, salt, and cayenne pepper. Cover skillet and reduce heat to low; simmer gently for one-half hour. Remove from heat, and serve over rice. I used less salt than called for in the original recipe, and it turned out just fine. I also thought that the original recipe called for very little rice, so I made more. Posted on April 8, 2018 April 8, 2018 by SherylPosted in FoodTagged recipe. This sounds like many of my mother’s one pot recipes. It’s nice to hear that this recipe brought memories of a dish your mother made. Simple to make and good. This brings back memories. My mother made chop suey regularly, but the version with beans sprouts etc. We also sometimes had the version of chop suey with bean sprouts when I was a child. At the time, we thought that it was a very sophisticated dish – even though it just came out of a can. It’s interesting how my perceptions have changed across the years. And, thank you to alerting me to this wonderful 1918 cookbook. I really appreciate the support of long-time readers like you. I grew up eating and then making this dish. We never included pork, and we sometimes added a little of this or that, but it’s the same recipe. I still make it from time to time, because it’s so quick and easy, and really — no recipe is required once you get the basics down! It’s interesting that this was published the year my mother was born. She probably grew up with it herself. In many ways it’s a perfect recipe – easy to make and tasty. And it’s always better the second day! North American Chop Suey, quite common to this day in New England. I’ve occasionally heard it called goulash, but when it is served in restaurants and school lunches, it’s just American Chop Suey. It’s interesting that this is still a common dish in some parts of the U.S. I’d never heard of it until I saw it in the old cookbook. That’s not a recipe that could have appeared in England at that time: peppers were unknown. It looks quite good, but as you say, I don’t know where chop suey comes into it. Or goulash, come to that. I continue to learn new things. I never would have guessed that peppers are a relatively new food in England. Too exotic for our climate in those days! I’ve never made chop suey before, but I always appreciate easy to make recipes that taste great. Will definitely give this one a try. Thanks. I think that you’ll like it. It’s yummy. My mother grew up eating this, but with macaroni instead of rice. She occasionally made it for us as well, but I always found it odd that it was called chop suey. I guess this explains it! Now that you mention it, I can see that this recipe would be wonderful with macaroni or other pastas. It’s interesting that your mother called it chop suey. It sure is an improbable name. Wow. This is one I wasn’t expecting. I’m taking it that you enjoyed this post. It’s amazing that a state defense council would get into cookbook publishing during WWI. There’s so much fascinating stuff on this site! Wow, it’s wonderful to hear that this post provided inspiration for your post. I know I really enjoy it! Good to hear that this post brought back memories – even if they weren’t the best. You are the most amazing blogest ever! And, you are an awesome reader. I really appreciate all your kinds words and support over the years. This is a really great blog. I’m still riffing off of it for topics for my own blog, there’s so much great stuff here. I have so much fun doing this blog, and it’s wonderful to hear when others enjoy it. Goulash is a frequent dinner entree at my house, but it’s made of macaroni noodles, ground beef and some tomato based sauce (my wife makes it, so I’m not sure what the recipe is). I’ve never looked it up, but I’ve wondered if there’s a real dish called that (and if that is it) or if its just a Eastern European term for general dishes like that. I think most are made with noodles,my mom used potatoes for that is what we had. Macaroni back in those days were a treat for us as we eat basically what we raised or grew. I do believe it is a European dish. Sometimes I think that we (or at least I) didn’t fully appreciate how healthy and wholesome the food was when we ate what we raised or grew. My mother used to make a goulash that sounds similar to your wife’s recipe. My father was home during the day because he was a minister and he fixed lunch for my sister and me during our elementary school years. Sometimes he would buy a can of chop suey, with those hard little noodles and we would have that. the only ingredient I can remember being recognizable was celery, which I notice was in this dish too. Similarly to you, the chop suey I remember came in cans. I think my mother bought a little kit that contained a can a chop suey, a little bottle of soy sauce, and a can of those hard noodles. I think I’ll try to make a lean version of this recipe!